It doesn’t matter which NFL team youll be rooting for on Super Bowl Sunday or where. One thing can be agreed upon by all football fans. Pop-up tents can really soup up a Super Bowl Party. So we wanted to talk about the best way to get that party started. For fans that are going to be watching the kickoff at a friends house instead of their own digs, a pop-up instant canopy kit should do the trick. They tend to come with their own convenient carrying case. Some of the pop-up tent kits also contain side rails, side walls and skirting. They are good to have for those that plan on celebrating in a windy, snowy or rainy area. This is especially the case if they are paired with portable tent heaters. Nowadays, there are portable tent heaters available that are cordless, use forced air and keep dangerous fumes out. They tend to run on propane and come with their own carrying cases too. One company that manufactures such pop-up tent heaters is Zodi Outback Gear. Fans looking to whoop it up in a warm climate may want to skip the side walls heater combination and choose a mesh wall kit and portable fan instead. They are great for air circulation purposes and will help keep away the insects. In addition, the mesh panels are safe for use around food service equipment. So NFL fans will be able to prepare their favorite Super Bowl snacks without fear. 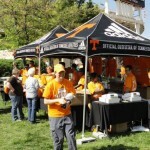 Speaking of Super Bowl foods, pop-up tents make it easy to set-up a mini kitchen and dining area. 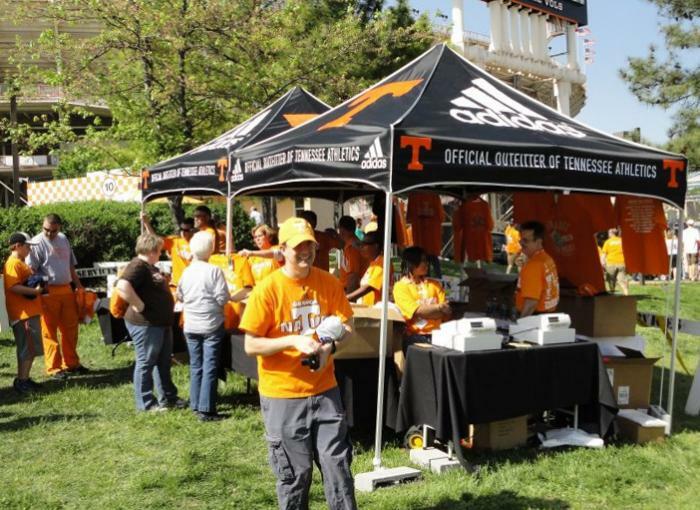 For example, crock pots filled with chili or buffet pans of chicken wings could be placed on portable folding tables under the tent along with folding chairs. A beer keg, coolers and other Super Bowl party supplies could be added to the area as well. Fans that decide to use electric powered cooking equipment or audio visual devices during the Super Bowl party may want to invest in cable covers too. They are designed to protect the wires from damage as well as help keep football fans from tripping. After all, no one wants to break a leg during the half time show. To learn more about choosing and setting up a pop-up tent for Super Bowl parties, please contact us at (877) 811-3911. Wed love to help you root for your favorite NFL team in style. This entry was posted in pop up tents and tagged instant tents, pop up canopies, pop up tents, superbowl tents, tailgating tents on January 31, 2014 by CanopiesAnd Tarps. Over time, winter snow, wind and ice can really do damage to canopy enclosures, pop-up tents and valances. So with spring on the distance horizon, you may want to spend at least one snow free day inspecting your outdoor areas. In the process, you may determine that its time to look into canopy top replacements. If a quick visual inspection of your canopy top revealed normal wear and tear or severe winter storm damage, make a note of it. Then take those factors into account when ordering your canopy top replacements. For instance, if you noticed holes and rust, wed suggest choosing a rust and tear resistant canopy top. The same can be said for damage caused by UV rays, wind, chemicals and other problematic substances. 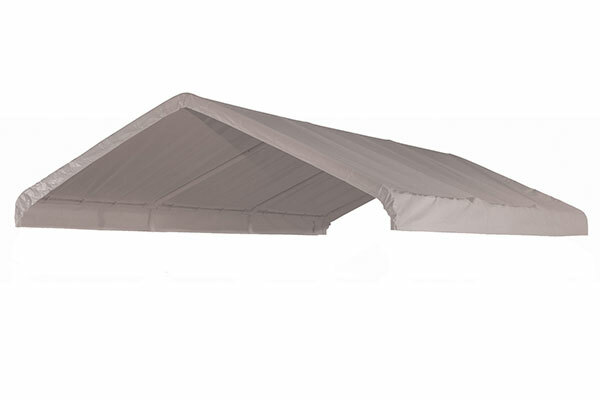 At Canopies and Tarps, we keep those types of canopy top replacements in stock year round. We also sell replacement canopy sides and doors. Many of them come in different colors, shapes and sizes too. In addition, we are a ShelterLogic authorized dealer. Therefore, you shouldnt have difficulty finding a high quality, affordable canopy top that will leave you 100% satisfied. Before installing the canopy top replacement, be sure to give the structures framework the once over. Doing so will help you identify and correct any minimal damage before adding the new canopy top. Items to look for are rust spots, loose connectors, unstable support poles, missing and broken caps. Once youve addressed any framework issues, youll be able to quickly install the replacement top, sides and doors. Providing that you measured correctly and ordered the right ones, they should fit like the originals. To discuss which canopy top replacement would be right for your situation in more detail, please contact us at (877) 811-3911. We are happy to provide both pre and post sale assistance. Our customer service department is open weekdays from 8 a.m. until 6 p.m. PST. This entry was posted in canopy replacement covers and tagged canopy replacement covers, canopy tops on January 23, 2014 by CanopiesAnd Tarps. Nowadays, many enterprising Americans are starting their own painting and handyman businesses. And personally, we cant blame them. Its a $27 billion dollar industry and the mean hourly wage is about $18. If you are contemplating joining the industrys ranks this year, dont forget to buy construction tarps. Construction tarps are not the same as those flimsy, little drop cloths that you see on sale at the paint store. We like to think of them as an essential, season extending tool. Yes, we said a season extending tool. What you may not realize just yet is that the conditions have to be optimal for painting. When they are not, construction tarps can prove to be heaven scent. Take spring temperatures and airborne pollen as an example. Together they can cause exterior paint to peel off, bubble, run and turn colors. Because of that, some exterior painting companies opt to refrain from doing business until May. They also tend to stop work once evening temperatures start dropping in the fall. Those with construction tarps in their arsenal, however, dont have to wait to start or stop early. Thats because high quality construction tarps can prevent those previously mentioned problems from happening. Theyll also protect the painting surface from accidental impacts, insects, moisture and other wind-borne debris. Of course they can also protect your painting supplies, equipment and the surrounding environment too. As such, its not uncommon to see construction tarps used year round in a variety of ways. For example, they could be used inside of a building to prevent cast off spray from contaminating other areas. They could also be used to cover commercial spray paint machines and metal paint cans during sudden summer downpours. 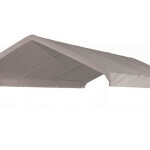 At Canopies and Tarps, we sell quite an assortment of construction tarps. Several are made with solid, lightweight, rugged poly. Others are constructed with a tear resistant mesh. The dark colored, mesh tarps tend to be wonderful for use during situations when ventilation and privacy are both a priority. To learn more about our array of construction tarps and how they may be utilized on assorted job sites, please contact us at (877) 811-3911. This entry was posted in Tarps and tagged blue tarps, discount tarps, tarps on January 16, 2014 by CanopiesAnd Tarps. Now that the New Years party hats have been packed away until 2015, you may want to think about winterizing your vacation homes hot tub. Otherwise, it may sustain damage before you have a chance to return to your vacation spot in the spring. If its your first time, wed suggest checking your hot tubs manual before giving it a try. Thats because the winterization process tends to vary based on the hot tubs make and model. However, in most instances, the process starts with draining the water out of the tub. From there, you may need to remove the filters and add motorhome antifreeze to various parts of the hot tub (i.e. diverter valves and jet lines). Once thats done, many people opt to clean and polish the hot tubs shell. Its not necessary though. They also seal the hot tub shut with the aid of a hot tub cover. Personally, we recommend taking that final step a bit further by covering the hot tub cover with a heavy-duty tarp. By covering the hot tubs cover with atarp, you are essentially adding an additional layer of protection. For instance, the tarp can prevent the winter elements from damaging the hot tub covers exterior. If the tarp is long enough on all sides, it could also help prevent the hot tubs outer walls from sustaining water and ice damage. At Canopies and Tarps, we have several products that can help shield your hot tub from the winter weather. Ourround poly tarpsare just one example. Made from 7 ounces of double-stitched polyethylene, they are designed to be UV resistant and waterproof. So you wont have to worry about the hot tub covers foam core soaking up the winter precipitation. We also haveinsulated vinyl tarpsthat would be wonderful for areas where extreme weather is expected. To learn more about our round poly tarps and other covers ideal for winterizing applications, pleasecontact usat (877) 811-3911. Wed love to assist you in finding the right tarp or canopy for your outdoor hot tub or spa. This entry was posted in Tarps and tagged tarp covers, tarpaulins, tarps on January 9, 2014 by CanopiesAnd Tarps.